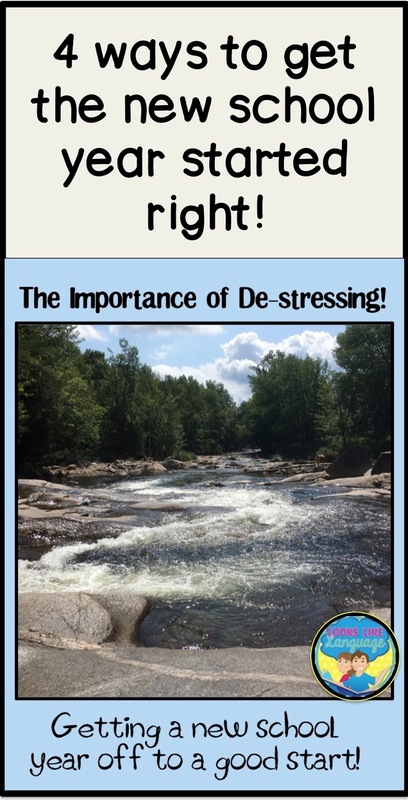 SLPs Need to De-stress- Life Tips! Children! Life's greatest blessing and a huge responsibility! One of the best aspects about being an SLP or educator is the difference you can make in a child's (and family's) life! Although we may not get the feedback, it is important for us to keep reminding ourselves that we can make a difference and that the impact can affect a child's life forever! For me at least, along with that great benefit benefit comes a great responsibility to try to be at my best for every child, every session, every day, because you never know when that moment of impact can begin. WHEW!! Often it has made me wish for a job where I could take it easy sometimes without feeling I might be letting someone down. So many terrific special educators never feel comfortable taking a necessary sick day off because of the sense of obligation they feel toward their students and their coworkers. How to deal with the stress? 1. Be sure that some of your time before school starts is to take care of yourself! 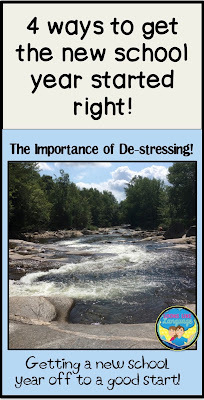 A calmer, more together teacher or SLP is always an asset to an overwhelmed student! 2. Get digital files organized! If you are spending a lot of time looking for what you need, you are wasting time that you could use having fun. - Make folders for each month, skill or theme on your computer to help you locate what you need for planning. When you download materials, place them in the appropriate folder. - If you see a great idea in an image, take a screen shot and place that in the file. Rename the screenshot with information to help you locate the original idea. - Keep a page of clickable links in each folder to match any images or free materials that are in the file. 3. Get paper files organized! For the same reason, of course! - Keep your original set of materials in a page protector. 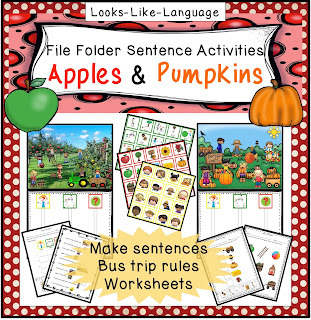 Place them in a binder with a label of the month, skill or theme. Set it up to match the computer file you printed it from! Need help with labels? Click here for a free, editable set! - Keep a yellow highlighter handy in your space at school. Mark the original page you take out to photocopy with a small dot in the corner, or your initials. This will help you put the cleanest copy away for the next time, and help make sure that you don't use your last copy! 4. Before you jump back into setting up your work space, take some time to do something which will help you to relax before the upcoming year. My de-stressing also usually includes some time spent in the mountains. Getting away from a rapid paced city environment to the peace and quiet of the mountains always helps me to relax before a new school year starts! Here's a photo of one of my favorite places to just chill. When the school year starts, take some moments to remember your peaceful times and places. I like to put a calendar page that reminds of waterfalls and forests in a place I can easily see when I am working. Just a glance up, along with a deep breath, can help me at times! If you are already in the thick of things, check out my scheduling tips and grouping tips for getting a good start! 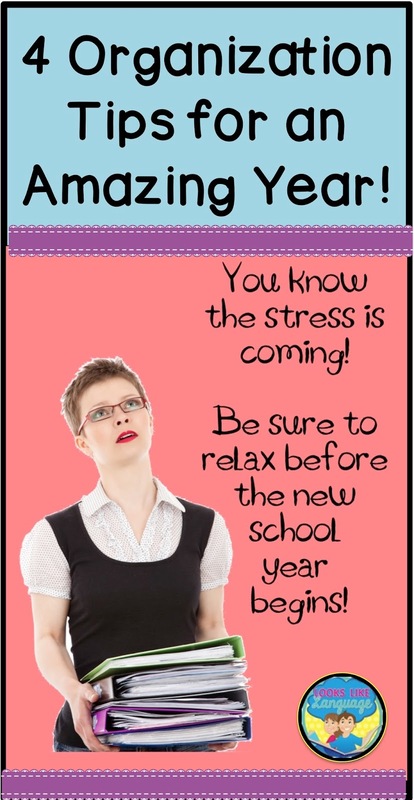 Hoping you have a relatively stress-less school year! What a crazy time of year! Whether you are just settling into your new caseload, in the middle of organizing your new school year, or having those last carefree summer days before the roller coaster ride starts, we all know how hectic the beginning of the school year is! I truly hope that my summer of helpful links gets your school year off to a great start! If you missed this series, you can start with the first post here. I don't know about you, but I hate spending precious time looking for materials, especially at the beginning of the school year. So, instead of writing another post with links to freebies, I decided to make a new freebie instead! Page protectors are my favorite way to organize worksheets. They help me to always have one clean, unwrinkled page that will zip through a photocopy machine. Since they are clear, I can see at a glance the types of worksheets that are in the sleeves. This year, I am going to make the binders for my worksheets look prettier! We all love a little prettiness in our SLP lives! I'm sharing the 2" binder spines with you. Just download them at my store. The PowerPoint presentation lets you edit everything: the names on the labels, the font being used, the size and the backgrounds. What do you like to do to help you stay organized at the beginning of the school year? 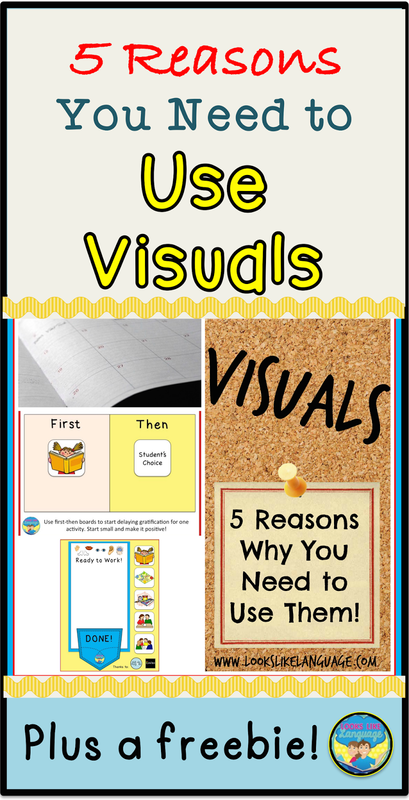 5 Reasons to Use Visuals Now! Here's hoping that you have the Best.Year.Ever! I'm linking up with The Frenzied SLPs to give some tips about visuals to help you achieve the best year ever. 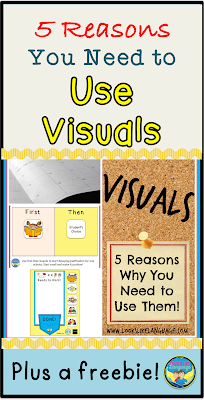 Visuals Aren't Just for Autism! 1. Visualizing is a well known memory aid, but it isn't an automatic skill! Learning to keep a visual memory of a picture we have seen is one way to start practicing building your own mental picture. Just think of all those What's Missing? pictures where kids need to remember the details of the original picture. It is a fun way to build memory skills! 2. Visuals help with auditory processing. When a student has a picture that is related to the words he is hearing, it is easier to make sense of the message. The picture can help connect the words to the concepts and retain the main idea in working memory. 3. 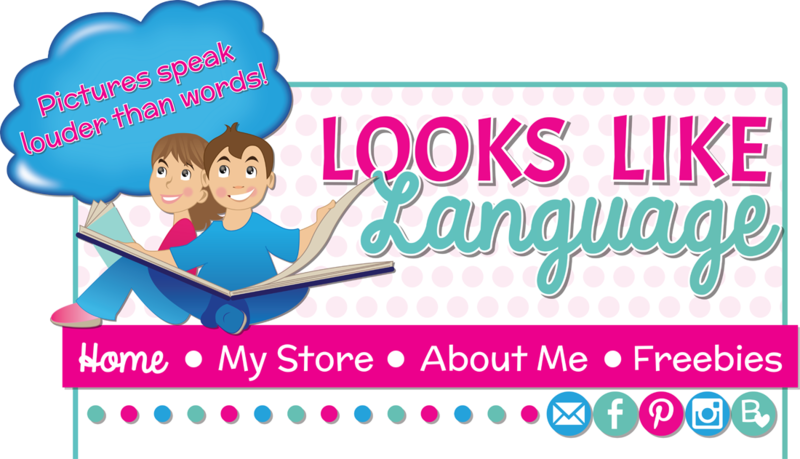 Visuals help with expressive language skills. When a student uses pictured words to formulate sentences, she can begin to see the pattern of the sentence structure, especially when repetitive practice is given that just switches out key words. 4. Visuals help with articulation skills. With decreased linguistic demands for sentence formulation, the student can put all his efforts into the motor aspect of sound production in connected speech and be more successful. 5. Visuals help everyone to function! What would you do without your calendar and planner? Do you have my free visual Getting Started with Autism Guide? Get it here! When educating students, so much of our efforts are put toward increasing comprehension skills, since that goes along naturally with teaching curriculum. As SLPs and special educators, though, it is so vital to remember to help give our students a voice! Whether they can use pictures, words, or a combination of both, helping kids to be able to express their needs, wants and ideas is a core skill. 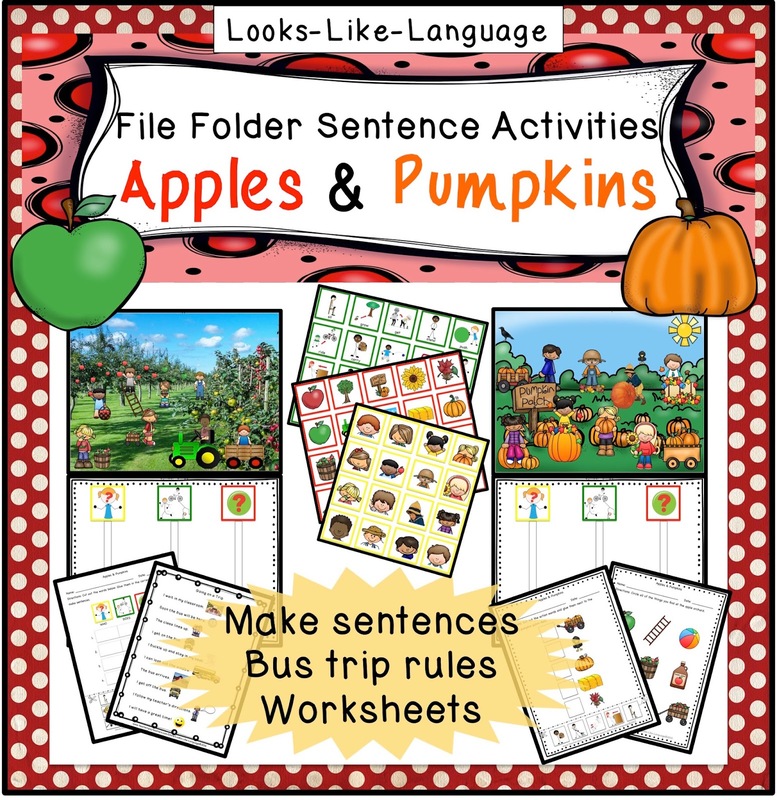 The newest set in my File Folder Sentence activities line, Apple and Pumpkins, may provide just the practice your students need to understand what to expect on your fall trips and be able to communicate about it! I've included a bonus social sequence page to show some steps for going on bus trips. If you like this idea, be sure to visit my store tomorrow, August 22nd, for the TpT Bonus Best Year Ever sale. My whole store is 20% off! Use the code 'oneday' to get an additional 8% off everything! SLP friends, if you have a product with great visual supports, feel free to add a link in the comments. Let's have the Best.Year.Ever! Literacy for SLPs- 15 Resources You Should Know About! 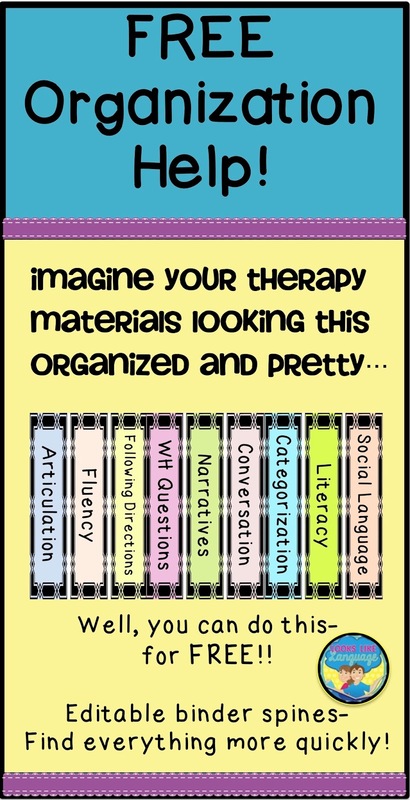 Are literacy skills the backbone of all that you do in therapy? I know that my students always need help with literacy skills, so no matter what their IEP goals may be, I’m always trying to get some fun books in my activities somewhere! If you’d like some tips on how you can use books in mixed groups, click here. But this post is not directly about books. 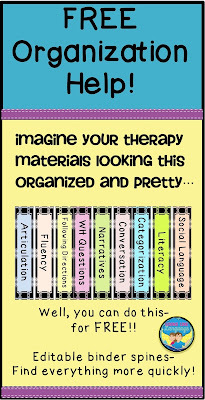 There are many websites that you can use in therapy to increase literacy skills while working on IEP goals. One way is to use comic sites- check out this post. You can also elicit a lot of language both reading and creating stories online. Let me save you some time and check out these links! They are all working as of the post date so try them out soon. I like to do this sometimes for a change of pace and to hear a different voice than my own. Since many stories have no pictures, students really have to rely on their auditory processing skills to understand. They provide a great opportunity for drawing pictures to practice visualizing, or for listening and taking notes on a graphic organizer about the important details. If you have curious students, or students who don’t like to read but have specific interests, this may be for you! Wonderopolis has a factual Wonder of the Day, based on questions from kids. Read the informative text (including questions like ‘Why do we burp?’) and do your own follow-up activities. Use this website while the grant is still being funded! Popular story books by famous authors are narrated by actors while the illustrations are being shown. I was so excited to see that it includes Thank You, Mr. Falker by Patricia Polacco! This website has original stories for children from ages 3 to 10. It links directly to YouTube, where you can listen to the author’s narration and see the illustrations. This website has a variety of original stories to read, audio fairy tales plus animated video fairy tales. This website has loads of original stories online, in varied genres and for all ages. 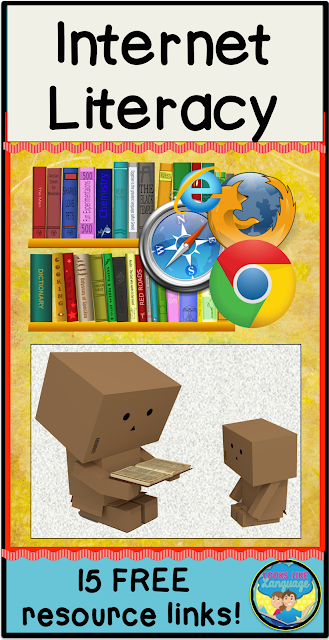 This site is dedicated to bringing books to the children of the world. It shows each page of the books. Turn the pages of the books online to read the varied choices for free. Students can also write stories for free, with a fee if you want a printable version. They can be translated to Spanish, Chinese, French and more with one click. Use this site while the grant is still active! Make your own story with picture choices and text. You can choose the story grammar elements, emotions to change the characters’ facial expressions and the actions. This website gives lots of control over every part of the story for students who are capable of completely making a story, including drawing. It could be useful for targeting specific language goals, such as facial expressions, sentence structure, organizing and telling a sequence of events for creative students. Read, write, think has a lot of interactive options, including this one for making your own fractured fairy tale. Make a Dr. Seuss story with beginning, middle and end. Students fill in the text boxes and choose the music, characters and setting, with all of the elements pulled together and played at the end. For your lego crazy kids! They can choose their own settings, characters and write text for each slide of the story. This website lets students make their own stories or read the large selection of stories that students have already made on varied topics. It is speech enabled and can be accessed by multiple AAC interfaces. This website has stories of all types available to download and play for free. Use their help page to access the stories from devices. Are you ready to give one of these a try in your therapy sessions this year? 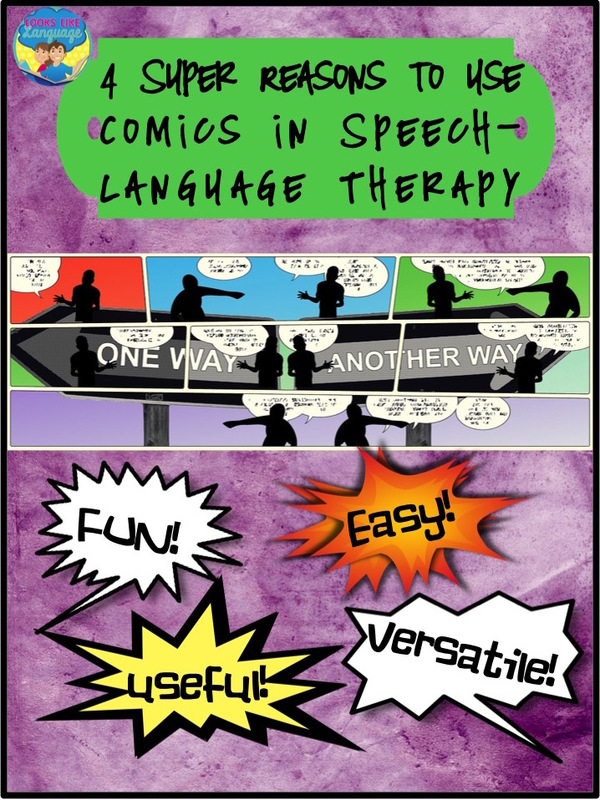 Have you ever used comic strips in your speech/language therapy sessions? You should! Yes, you really should, and here are 4 super reasons why! Face it, we all have our own styles and it is easy to get stuck in a rut based on what is comfortable for us. Maybe you are naturally funny and won’t need this particular reason. (But keep reading- one of the other reasons will work!) I am not naturally funny if you are over the age of 5, so I need some extra help sometimes. Comics can be a change of pace that lighten the mood. 2. The language of humor is complex! Often humor is based upon plays on words, changed stress patterns, and nonliteral meanings versus the literal picture. Some of our students, especially ones with learning disabilities or on the autism spectrum, need some extra help to understand humor. 3. You can work on so many goals! Articulation students can write and then read the text or explain the joke using their target sounds, or carryover the use of their speech sound in conversation during the activity. 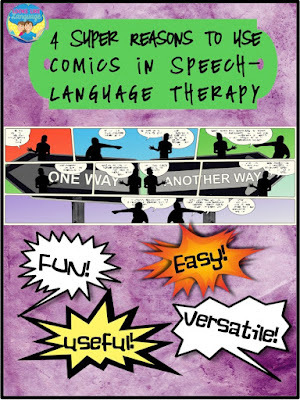 Phonological awareness is addressed as so many comic strips are funny because of changes in sound, spelling and stress that lead to ambiguity. 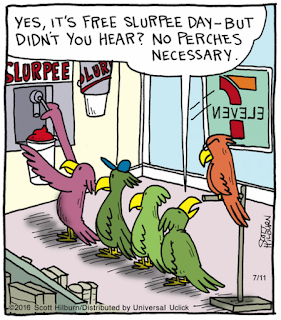 Check out the comic below from one of my favorites- The Argyle Sweater by Scott Hilburn. For language, you can work on following directions to use the site, sequencing, narrative structures, sentence formation, answering questions, making inferences, understanding figurative language, comprehending multiple meanings and non-literal language, problem solving a social scenario, facial expression, and showing different points of view in the characters’ statements, to name a few. 4. I’m giving you links to sites which will make it easy! This is my favorite site for finding comics to print and use in therapy. Of course, you could keep a list of links to pull up on your computer and go the paperless route, too! If your students are into superheroes, this may be the site you want! My favorite site for making comics in therapy! It is free, easy to use, lets you save and print, and is adding additional choices all the time. This may be my new fave, as I was looking for activities to supplement work on facial expressions, body language and character traits. This site can do regular cartoons, but check out the option called TraitR, too! You do need to sign up, but there’s a free option. The free version of this site has more sophisticated characters and themes, letting you make more choices in the graphics being used. This comic creator is more basic and in black and white, but it can be a great place to start for younger kids, or if your school won’t let you access the other sites. Like the idea but need some more in-depth help? Take a look at Cartoon Cut-Ups: Teaching Figurative Language and Humor by Jean Hamersky. Also try Cecile Cyrul Spector’s books: Sounds Like Fun: Activities for Developing Phonological Awareness and As Far as Words Go: Activities for Understanding Ambiguous Language and Humor. I hope you have some fun with comics this year! If you need some information to be sure you are on the right path with your therapy, this post is for you! My students have covered the range of ages and communication difficulties over the years. I suppose the biggest common denominator has been that the majority of my students have been functioning way below the 16%ile. I even considered naming my blog ‘Life Below the 16%ile’, but went with Looks Like Language instead. 1- Since my students are going to need much support and much practice to be able to learn, maintain and functionally use the skills I am teaching, I want to think ahead and make sure that I am working toward practical life skills that will be helpful and worth all the effort of learning. 2- If someone has also thought about this, and possibly figured out a best practice for the skill, it is worth the time to educate myself first! So, with that in mind, here are some of the sites that I feel are definitely worth visiting. This free information site currently has 45 different modules to help people working in the area of autism. This link is to a preview of the program at Autism Navigator. The Autism in Toddlers video, showing clips to help with earlier detection, is free when you enroll. This informative site has information on so many topics related to learning disabilities! There are links to informational resources and more at this site. This is the link to all of the interactive resources at Read-Write-Think, which can be adapted to reach our speech/language goals based on our interactions with the students. This is the link to the interactive activities at Scholastic. Find an activity to match your students goals and interests or curriculum. This website has practical ideas, information, videos and supports. These sister sites offer lots of information and tips. 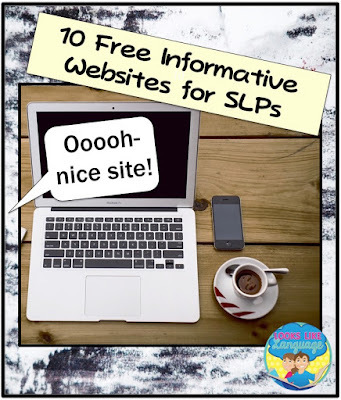 Informative guidelines for SLPs and some free downloads. It is always a good idea to check on best practices here! Need some help getting started with computer technology? These are generally useful sites! What website do you go to for help?